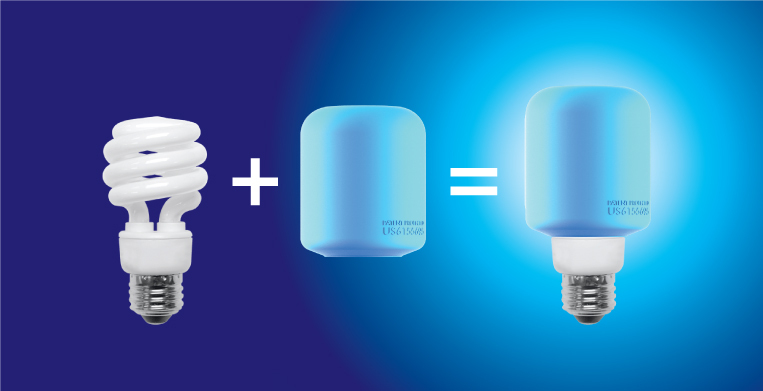 Moodies™ are silicone light bulb covers that change the color of any CFL or LED light bulb! Made from the same heat-safe silicone used in oven mitts or bakeware, Moodies are safe to use on any CFL or LED light. Moodies are available here online in a variety of colors and coming soon to a retailer near you! Rolling around in your grave while the neighbors throw another lifeless luau? Show them how to haunt the living with our Halloween Pack of 8 Orange and Spooky-Purple Moodies with a glow in the dark afterglow. Just slip Moodies over any CFL or LED bulb and they'll be screaming for more! This room was lit with a Moodie Rainbow Pack. You can buy one here. Moodies are colorful, heat resistant silicone caps that fit snugly over CFL and LED bulbs, changing their color simply and safely. Moodies easily cover all CFL/LED lightbulbs instantly changing the color and the mood of your room! It's the next thing in mood lighting. Moodies should only be used with CFL or LED lightbulbs. Made from the same silicone material found in bakeware, Moodies provide excellent heat-resistance when used on CFL and LED bulbs. Moodies are coming to a retail store near you in 2015. In the meantime, keep your eyes peeled for deals and specials in our webstore!